The best seasonal recipes are templates that work with whatever happens to be available fresh from your backyard or local farmers’ market. 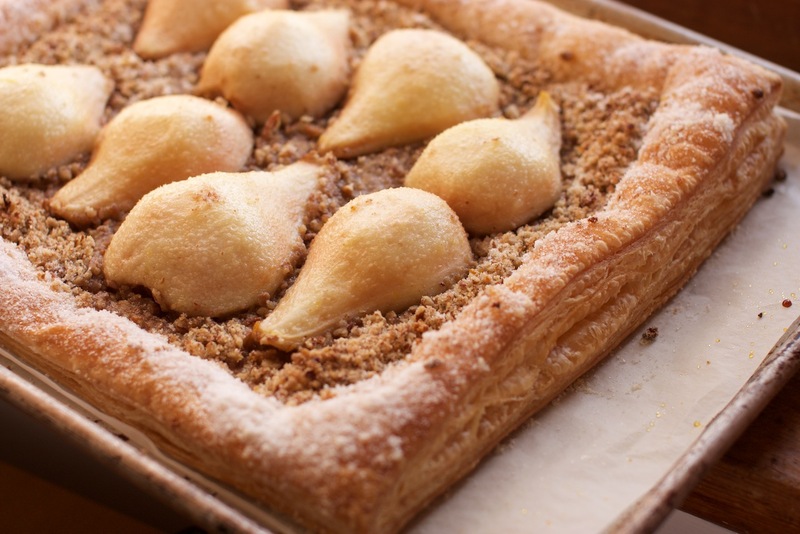 This pear tart, for example, could turn into a plum tart, or a peach tart, or a fresh fig and raspberry tart (and yes, it’s possible to grow fresh figs in New Hampshire). Unless you have access to a nut tree – and we do grow black walnuts, hazelnuts, butternuts, hickory nuts and chestnuts, among others in southern New Hampshire – your nuts probably won’t be local. But if you can get local nuts, use them, by all means. The basic concept is to make a sandy mixture of nuts, sugar and flour, sprinkle it over a rectangle of pastry (puff pastry as here, but plain old pie dough will also work) and top it with very ripe fresh fruit. As the tart bakes, the fruit releases it’s juices, which are soaked up by the nut mixture. The nut mixture becomes soft and a little chewy, and the pastry stays crisp on the bottom. For my tart, I used home-made, all butter puff pastry (here’s a link to that recipe) but you can substitute store-bought frozen puff pastry and get great results. Use Trader Joe’s or Dufour brands if you can find them, because they are made with butter and taste better than those made with shortening. Otherwise, Pepperidge Farm makes a reliable and easy-to-find frozen puff pastry. These brands are packaged with slightly different weights, but all are close to 1 pound, which is what this recipe calls for, and all will work. Plan ahead so you can follow the directions on the package for refrigerator defrosting. And if the pastry comes in two pieces, simply make two smaller tarts. This tart goes together quickly once the ingredients are assembled. Try serving it, as I did, fresh from the oven for a lazy Sunday morning brunch. It would also be delicious as the finale to a dinner party featuring the best of what fall has to offer. Either way, it is best eaten the day it is made, or it may become a little soggy. Roll the puff pastry, if necessary, into a rectangle about 12 inches by 14 inches, and a little less than ¼ inch thick. Use a knife to cut directly down (do not drag it – dragging seals the edges and will keep the pastry from rising) to even the edges of the dough (reserve the scraps and re-use if desired). Place the puff pastry on a sheet tray that has been lined with parchment paper. Prick the pastry all over with a fork, leaving about 1-½ inches all around the edge of the pastry un-pricked. This will allow the edges to rise in the oven while the center of the tart stays flat. Place the dough in the refrigerator to rest. While the dough is resting, zest the orange and lemon and reserve the zest. Squeeze the juices of the lemon and orange into a medium sized bowl. Place the zest and ½ cup sugar in the bowl of a food processor and pulse until the zest is well combined with the sugar. Leave the sugar in the processor and proceed with the next step. This will allow the sugar to absorb the oils from the zest and add a lot of flavor to the mixture. Peel the pears, one at a time. When a pear has been peeled, cut it in half, use a melon baller or other implement to scoop out the seed cavity and tough stem, and place the halves in the citrus juices, coating well to keep them from browning. Proceed until all the pears are soaking in the juice. Place the nuts and the flour in the food processor with the sugar and zest and pulse until they make a coarse mixture. Remove the pastry from the refrigerator. Lightly sprinkle it with half the remaining sugar all the way to the edges. Cover the pricked portion of the dough with the nut mixture. Arrange the pears on top of the nuts in a decorative manner (discard the citrus juice or use for another recipe). Sprinkle the tops of the pears with the remaining sugar. Place the tart in the center of the preheated oven. Allow it to bake for 10-15 minutes until the edges have risen nicely, then reduce the temperature to 325 degrees. Continue baking for about another 45 minutes, turning once or twice to ensure even browning. The tart is done when the pears have released their juices into the nut mixture and they are soft and beginning to brown a little on top. Allow the tart to rest for 10 minutes or so before cutting with a serrated knife. Serves 8 or more. This entry was posted in baked goods, desserts and tagged baked goods, desserts, pears, pecans, puff pastry by Cold Garden Warm Kitchen. Bookmark the permalink.